SALT LAKE CITY, Aug. 30, 2018 (GLOBE NEWSWIRE) -- InvisibleShield®, a ZAGG Inc (NASDAQ:ZAGG) brand and the leading global innovator in screen protection, today announced a strategic partnership with Healthe®, a health protection-driven technology company developing products devoted to filtering high-energy visible (HEV) blue light from digital devices. The partnership will allow InvisibleShield to infuse Healthe’s innovative Eyesafe® technology into its screen protection solutions, safeguarding consumers not only from a shattered screen, but the effects of harmful HEV light as well. The average American now spends more time in front of screens than sleeping, at 11 hours per day, including three and a half hours on a digital device, with smartphone usage accounting for 62 percent of that time1. These amounts of screen time may affect vision health, leading to digital eye strain, dry and irritated eyes and can impact sleep2. Healthe’s Eyesafe technology selectively filters out portions of the HEV blue light spectrum that are considered most harmful while still maintaining the superior color performance of your device display. Healthe and the Eyesafe Vision Health Advisory Board are comprised of leading eye care professionals across ophthalmology and optometry focused on public health advocacy, industry research and standards development. Healthe strives to deliver technology that reduces eye exposure to HEV blue light. 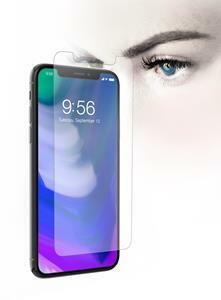 InvisibleShield also today announced the first new-to-market screen protector developed with Healthe, Glass+ VisionGuard for the iPhone X. The all-new screen protector features a protective Eyesafe® technology layer that blocks harmful HEV blue light associated with device displays. Glass+ VisionGuard defends against harmful HEV blue light and promotes better eye health while providing the powerful impact protection for which InvisibleShield is known. InvisibleShield and the InvisibleShield logo are trademarks of ZAGG IP Holding Co., Inc. Healthe and EyeSafe are trademarks of Healthe LLC. Healthe is a global supplier of Eyesafe® blue light filtering technology for the world's leading device manufacturers. Eyesafe technology and associated intellectual property portfolio was developed by world-class engineers and a team with decades in electronics, display materials, and light management to selectively filter UV and high-energy visible (HEV) blue light while maintaining color quality. Based in Minneapolis, Minnesota, Healthe works to develop technologies and standards in conjunction with leaders in the eye care community. To learn more about Healthe and Eyesafe® technology, please visit Eyesafe.com.